Dorian is a Breton thief and a pirate aboard the Red Wave, under the command of Safia. Dorian wears a set of leather armor, including the bracers and boots. He carries a belted tunic, a selection of common loot and gold, and an additional small amount of gold. He carries a leveled war axe, bow, and twelve arrows, all of which can be up to Daedric in quality. Should you approach him, Dorian will quickly explain to you that his interests may be a bit more refined as compared to most pirates: "Forget wine, women and wealth - give me a calm sea and a good book, and I'm happy." 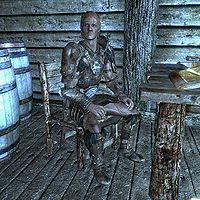 He will then elaborate on this, telling you about one of his favorite authors: "I hear Adonato Leotelli's staying up in Windhelm. I've read a few of his works. Be good to meet him someday." Thinking that he may be coming off too gently, he will then provide you with a stern reminder: "Don't misunderstand me, friend. I like my quiet, and I like to read. But you trifle with my ship, my crew, or my captain? I will kill you." He may also tell you about his life on the open waters: "You've not seen the night sky until you've seen it on the open sea." He will also comment on his captain, Safia, as long as she is still alive: "I've only been a part of the Red Wave's crew for a few weeks, but I've already learned to stay out of Captain Safia's way." A Redguard male named Dorian appeared in Oblivion. While Dorian is technically a leveled NPC, you would need to be level 251 or higher to have any of his stats increase. Since this is highly unlikely, he is effectively unleveled, with Health fixed at 250 and Stamina fixed at 210. This issue has been addressed by version 4.0.6 of the Unofficial Skyrim Special Edition Patch; his level is set to PCx1. The fix also includes removing his essential status. Dorian does not exit the interior of the ship. This becomes problematic when a radiant quest chooses him as the target, as, once you have entered the ship, all he says is that you aren't supposed to be there. This issue has been addressed by version 1.3.3 of the Unofficial Skyrim Patch; Red Wave crew members can now show up at the Winking Skeever. You can start a fight with him then run outside. Once outside, and away from the entrance, lower your weapons and surrender. Talk to him before he has a chance to go below decks. Having a follower can complicate your efforts to draw him out. The follower will continue to engage in combat and will prevent a surrender. Using the command AF525.MoveTo Player to place him near you.